The AGM took place in October and has seen our own Margot Gale and Sue Blackley elected as Vice Chair and Secretary respectively. They have been assisting with the formation and launch of the Wollaton U3A which officially launches at 10 a.m. on 27th November in St. Leonard’s Community Centre on Bramcote Lane, opposite the library. Any of our members living in the Wollaton area may wish to join the new Wollaton U3A and of course, you can retain your Beeston U3A membership in any case. The membership fee is reduced when you are already a member of another U3A. However, Wollaton will not be part of our “Cluster” until it has been established for a year and can run independently. There are some benefits to members who may attend up to 3 groups in another U3A within the Cluster. We are already in a Cluster with Long Eaton, Stapleford and Ilkeston. There are 29 U3As across Notts and the network enables the sharing of ideas. There is much to be learned and shared between the groups. Peer Support Groups help to bring Group Leaders together, to share experiences and swap advice and materials. We here at Beeston, can offer to host such a meeting, and invite Group Leaders who run a similar interest group, to come together and share their ideas. They are informal meetings but run under the auspices of the Notts Network. The Network contact is our very own Margot Gale, and she distributes information across all of the U3As. The secretary is Sue Blackley, so we are prominent in our support for the Network. 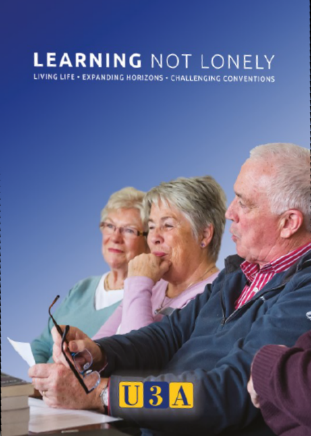 Early in July, U3A produced a report called Learning not Lonely. It presented research which showed the exceptional impact of the U3A movement on wellbeing in later life. Guests in attendance included leaders in policy and influencing, elected representatives, public health and charities. The report uses a number of publicity photos which were taken of Beeston U3A members a few months earlier. So that was why the photographer took so many photos of our members! From now on we are going to include a short report from the Notts. Network Committee Meeting in each of our Newsletters. The aim is to update you of any decisions which have been reached by the 28 U3As which are represented at the Network meetings and to forward any information which may be of interest to our members. Following the recent Notts. Network meeting on the 25th January it was decided to disband the Regional Representative Council which represents the region at National level as it was felt that it was an additional unnecessary layer of bureaucracy. Jane Pavier continues to represent the region on the National Executive Committee as the East Midlands Regional Trustee. We are pleased to announce that the video recording of our Celebration of 1,000 U3As is now available to view on our YouTube Channel. The Nottingham U3A is hosting a Fashion Show and Fundraising Event on Tuesday 28th March at the ICC ,61b Mansfield Road 1.00 pm -3.30 pm. The Fashion Show will feature many high street brands including designs from France and Italy. Sizes range from 8 -30. At the end of the show attendees will have the opportunity to purchase the clothes at half the cost. Tickets cost £5 and are available from the Nottingham U3A Office.